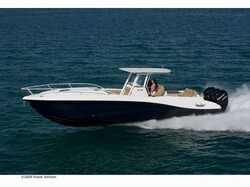 This Quad Engine 36' Deep Impact is now available at a deeply discounted price. We have used this boat as a demo model for 80 hours. It is now time for this boat to find it's new home. This boat is very well equipped and looks great. 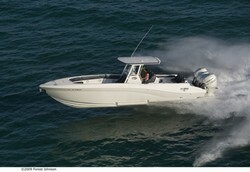 The QUAD 350hp Mercury Verados are custom painted Pearl White to match the hull. Other notable features include: Garmin 5212 GPS, VHF, Bow thruster, Windlass, Bolster Seating, Refrigerator at helm seat, Monster stereo with 12 7" speakers and 4 10" speakers, and powdercoated t top frame. This is a very strong opportunity to be in this boat at a great price.